2017 seems to be the year to catch up with German traditions I've missed. Back in January, it was molybdomancy. 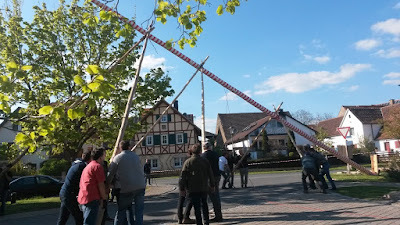 Yesterday, I watched a Maibaum (maypole) being erected. 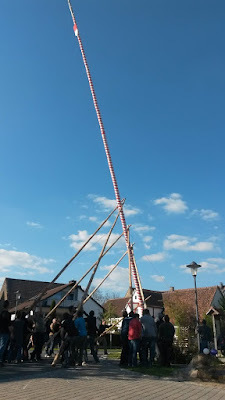 The Maibaum (maypole), decorated and ready to be set up. 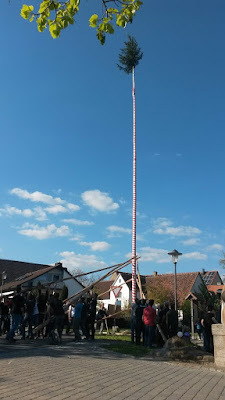 The maypole is put up on the last day of April (or on May 1, depending on the region) and is a symbol of the beginning of spring. There are a lot of stories as to the origin of the maypole tradition. Most cite Germanic rites and forest gods. 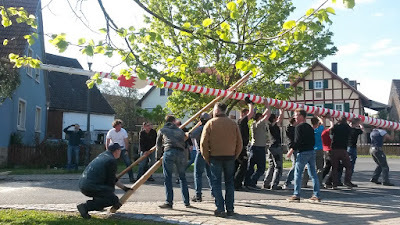 Four groups push up the maypole, using tree trunks called Schwalben. Here's the first group. So yesterday I watched one being erected for the first time. It was a big deal in my in-laws village. About thirty men were needed to erect it. It was hard work—my husband ended up with scraped and bleeding hands. 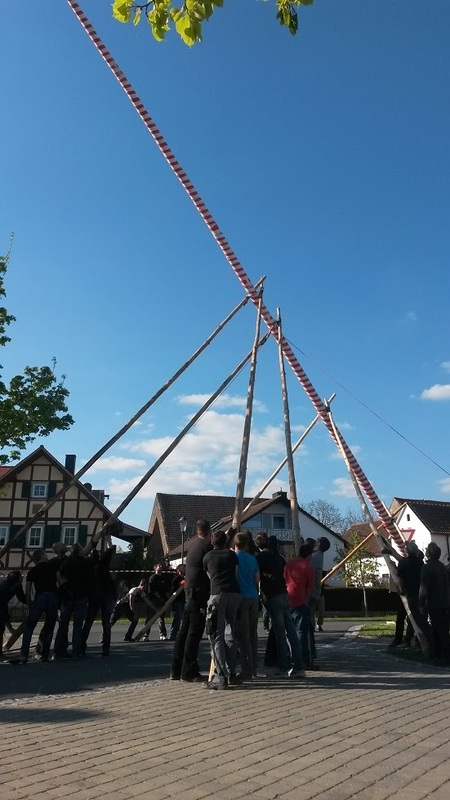 I also learned that erecting the Maibaum is a guys-only thing. ¯\_(ツ)_/¯ Anyway, all total probably 100 people attended. Not bad for a village of 280 people. 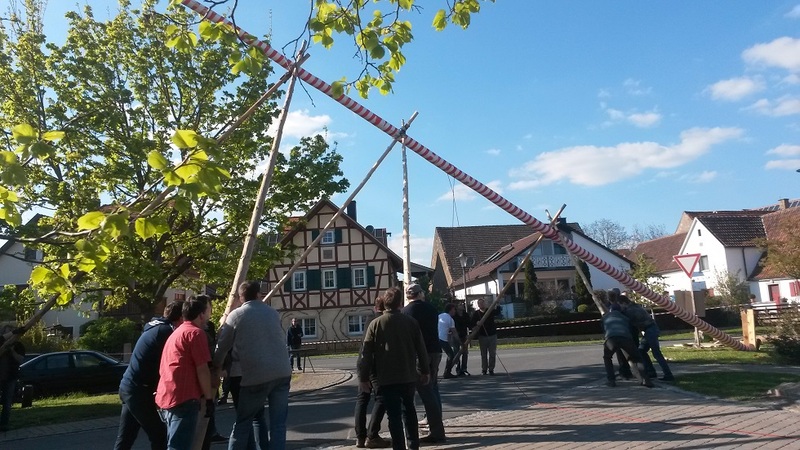 Besides the fun of watching the maypole, you could buy beer, soft drinks and bratwurst. As for the maypole itself, different areas in Germany use different types of trees, often birch or spruce. Some strip the trunk and decorate it, and some leave the tree as it is naturally. Other areas of Bavaria tend to decorate in blue and white, whereas we in Franconia use red and white. With each additional group, the maypole is pushed higher. 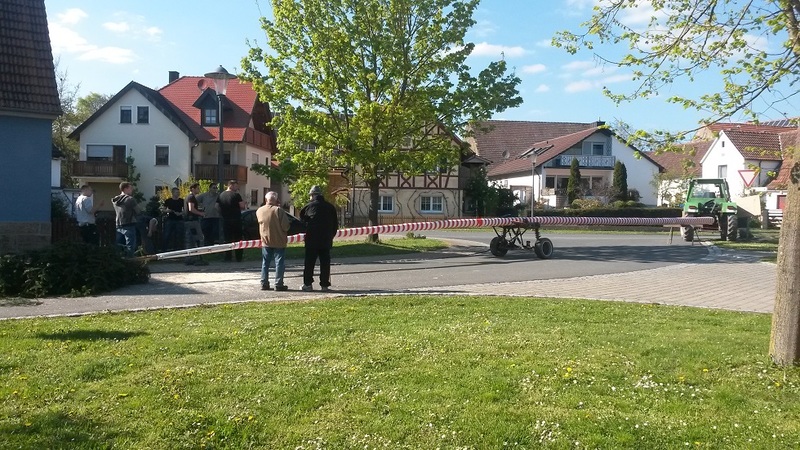 Here, the third group has joined with their Schwalben. Now all four groups are working on it. 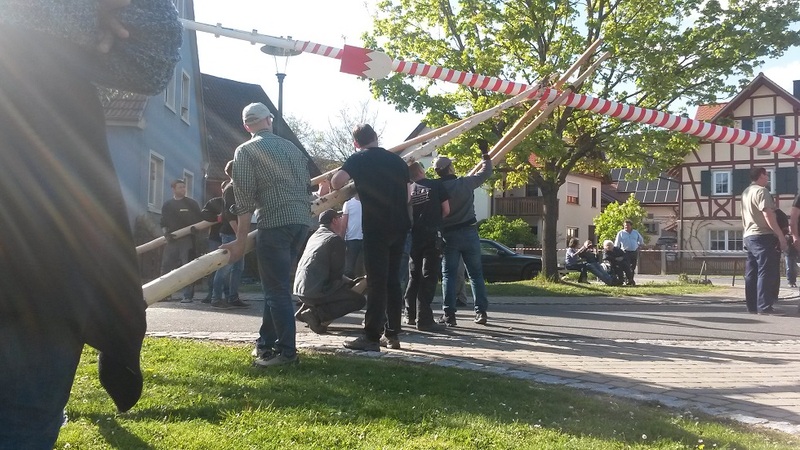 How can you make a maypole even more fun? By stealing it! Seriously, stealing the maypole is a popular tradition, so often a few guys camp out next to the tree to guard it. If someone does manage to get away with it, they demand ransom–usually beer and food—before they'll give it back. And no, I have no idea how you'd steal something that big. The maypole is so tall, I accidentally cut off the top when taking the picture! - the people who used a helicopter to steal one from the Zugspitze mountain. - the senior citizens whose maypole was stolen, and they stole it back. 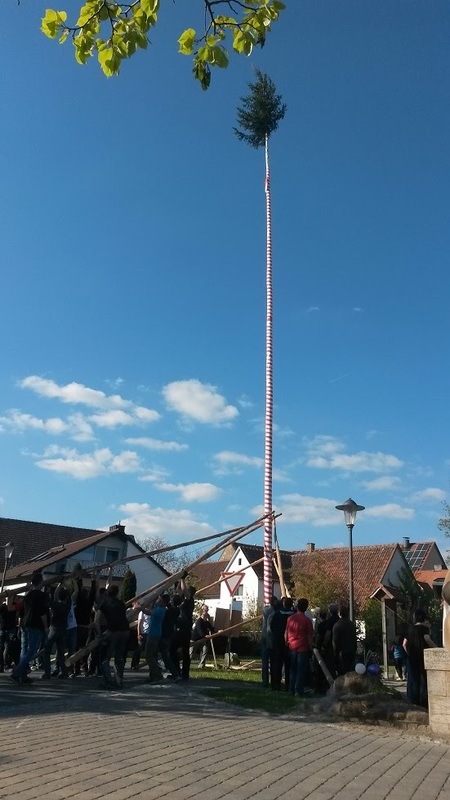 There are a lot of different maypole traditions around Germany. If you know of any (also from other countries! ), I'd love to read them in the comments!